A cooperation between Norewgian brewery Nøgne Ø and Swedish brewery Dugges, this is their interpretation of the traditional Finnish style. Brewed with malt, hops, rye, wheat, sea wormwood, juniper twigs, honey and yeast from Belgium, Germany and Britain. A - 4 - Soft translucent rosy amber. Fizzy tan head that dissipates quickly. S - 4.5 - Lovely, prominent, malty honey smell exclusively. This smells so deliciously good. T - 4.5 - Lovely malt with the saturation dial cranked up, and rich honey sweetness. Reminds me almost exactly of when I used to eat my Raisin Bran as a kid and would drizzle thick streams of honey over it after I poured the milk. I can't tell if there's a hint of spice here or if it's the prominent booze fumes or the spritzy carbonation or a combination of all three, but something gives it a real zing. I was expecting this to taste like a giant mouthful of gin thanks to the juniper twigs, but really I'm struggling to detect those notes at all. M - 4.25 - I was expecting a sharp, piney beer, with an accompanying thinner mouthfeel for max sharpness, but instead I've got something with a lovely velvety mouthfeel. It's north of medium bodied and feels so good to pull into the mouth. O - 4.25 - Firstly, I love this brewery and secondly, I want to try all beer styles. So I bought this one and figured it would be my only Sahti ever based on my expectation of the pine tree it would taste like. I have kind of been dreading cracking this open and figured I'd dislike it. But I'm so glad I did, because instead I've gotten something that comes across much more like a lovely English-style Old Ale, with a wonderfully delicious honey base. What a treat. Nogne O does it again. I don't think I would call this beer complex, but the honey-malt combo is so delicious that it gets a pass. MAN it's delicious. I googled to find the serving temperature recommendation and it said about 40 degrees, but based on the thick rich sweetness of it, I figured it would be better closer to room temperature. So I left he last third to warm up. For once I think I was wrong. I think it was actually a good bit better colder. The taste is so strong it doesn't get wiped out by the cold. A special twist on the Finnish style Sahti, brewed at Nøgne Ø in cooperation between Dugges Brewery, Sweden, and Nøgne Ø of Norway. Brewed with rye and wheat, sea wormwood from the Swedish archipelago, juniper twigs from the Norwegian forests, honey from heather flowers in Telemark and three selected yeast strains from Belgium, Germany and Britain, and of course, some malt and hops too. 500 ml bottle, courtesy of Cardinal Pub & Bar, Stavanger. ABV is 11%. Deep golden colour, slightly hazy / honeyish, with a big off-white head. Very nice aroma of juniper, heather honey and hops. The mouthfeel is rich, warming and alcoholic. The flavour has loads of honey (too much) and malty sweetness. Notes of juniper too, very moderate bitterness. Interesting, but too sweet. A fairly nice sipping beer all the same. Pours a hazy medium orangey-amber color with generous white head. Nose is quite assertive with herbs, honey, and a medicinal quality. Honey is up front on the palate as well with some malt sweetness, fruity berry flavors in the middle, and the finish is moderately long with herbal flavors. If someone handed me the glass and didn't let me taste it, I'd swear this was a mead. Big honey smell with a faintness of juniper berries, maybe some clove. Taste is fairly big on the honey too, but you can also taste the juniper and clove like spices as well. Starts out honey, but fades out to the other tastes. It hides the 11% VERY WELL, which is great for cold nights. It could sneak up on you if you're not careful. Definitely a great beer for the holiday season. Actually, I could drink this in the summer too. Probably get me another bottle sometime soon. It's my favorite Sahti thus far. A solid pour into my 25cl tulip glass produces a three-finger thick, lightly tan colored head. The beer is an amber hue that shows a lightly hazed, pale amber hue when held up to the light. The aroma smells strongly of honey and there seems to be a sort of dusty malt character towards the finish. The honey is really dominant and it is hard to smell anything else, no matter how hard I try. Fairly sweet tasting, though not as intensely so as the aroma would suggest. A light tartness kicks in towards the middle and the beer finishes with a honey flavor that lingers on the palate in that sort of medicinal way that honey does. My second sip seems a bit more dominated by the honey flavors, though still not as much as the aorma was. A solid pale grain character is here, which contributes to some of the sweetness and there is also a grassy, sort of biscuit like grain character. Some herbal notes and perhaps some menthol like, turpene leaning notes hint at the juniper twigs. The finish has a very light orange accent to it as well. This is definitely a bit aggressively carbonated; this likely helps to lighten the sticky body a touch as I don't seem to mind that this is fairly fizzy. This beer does hide its alcohol quite well, other than being fairly thick textured there isn't much in the way of alcohol heat, so you might not guess that this is 11%. Another interesting interpretation of a Sahti, one of these days I am going to have to track down a good traditional one, but until then I continue to not really be able to get into the interpretations that I can find. I have nothing with which to compare this as far as style goes, but we'll have a go at it anyway. Pours up a very cloudy reddish orange with loads of rather large (2 - 5mm) pieces of debris floating about. Some of these actually look large enough to stab with a dinner fork. Head is slightly off-white and is about a half-inch thick blanket. So far, looks interesting and inviting. Smell is huge honey and little else. Clearly, there are many things in this bizarre concoction, but the honey is about the only thing I can get on the nose. Taste definitely makes up for a lack-luster smell with substantial depth and complexity. The sweetness of the honey is there and is balanced nicely by the juniper twigs and sea wormwood (artemisia maritima). It is also interesting to note that the 11% abv shows up about 2 seconds after you swallow. Were I to guess without knowing, I'd say this was 9-ish, so the alcohol isn't as perceivable a it could be. In any case, though, it is non-existant (nearly) until you swallow. Mouthfeel is hearty, to say the least, and even as peculiar as this odd creation is, I think it drinks nicely (all things considered). Not familiiar with this style, I am left to review the beer strictly as it stands on its own. Certainly, there is nothing to complain about in its appearance. Golden yellow with a white head. The smell is crazy--honey, honey, HONEY. I've not had a mead with as much honey aroma as this! No juniper or pine in there as I expected given the description of the style, but no fusel or other alcohol flavors either. At 11% this beer is ridiculously quaffable. The only drawback is the honey sweetness. Not sure I'd want a full bottle to myself, but I enjoyed my sample with some creamy goat cheese, which made the beer all the more enjoyable. I'd recommend this paired with with some rich creamy cheese or other fatty food to play off the sweetness. Interesting in its own right, I'd love to try some other sahtis to see how they compare. Moderately yeasty persimmon (like a recently shaken snow globe) with a faintly crackly crown of putty colored cream. There's pretty good cap size and persistence, especially given the ABV and the relative lack of hop resins. Shouldn't beer of this style have no hops? Anyway, love the unfiltered appearance. The nose is all kinds of interesting. It's musky and floral and herbal and spicy... I've never smelled anything quite like it before. This is only my fourth Sahti in case you're wondering. Maybe the sea wormwood from Sweden is what's putting the 'can't quite put my finger on it' spin on things. The flavor is just as off-the-wall. There can't be too many fermented beverages in all the world that taste like Nogne-Dugges Sahti. Gotta be the wormwood, which is an acquired taste to say the least. This stuff reminds me of the beer version of a heavily herbed liqueur. Juniper twigs come through loud and clear, but the beer doesn't taste too much like gin. Honey adds a background sweetness that is easily controlled by hop bitterness. That's verboten for the style, but you'll never see me complain about the use of little green cones. Wow, what a complex and incredibly interesting ale. The flavor profile is so varied and so aggressive that the alcohol is buried almost without a trace. A gentle warming on the way down and a slight tongue numbing as the ounces pass is the only evidence of its presence. Sipping is definitely the way to go here. How do I know what the mouthfeel on a sahti should be like? This one is akin to a 7.0% IPA with perhaps a little more slickness on the finish. Although the carbonation is on the slightly spunky side, it works well. Nogne-Dugges Sahti joins Dogfish Head Sah'tea and Malmgardin Panimo Arctic Circle Ale as the finest versions of this rather odd style that have ever entered my glass. I would never drink it on a regular basis, but what a mind- (and palate-) bending ride this has been. Not too interesting nor drinkable. Spicey aroma, floral. Cloudy fruity colour. Yeast in taste with a mild pepper and mildly astringent juniper, taste even moderated by the honey, subdued fruit. Passable.Easy average mouthfeel, little carbonation.Odd. Purchased at Belmont Station, 500ml bottle, Poured into KleinBrouwerij tulip glass. Taste of honey sweetness, pepper, juniper, citrus, cloves.... many spices at work in this beer. Medium thickness, syrupy, active carbonation. The aroma refreshing, making each sip is such a delight, and 11% i would have never guessed. The colour is red-orange-brown; the liquid is very cloudy. The finger thick head sinks quickly to an off-white layer. No lacing. The smell is yeasty and sweet with some Belgian notes of exotic fruits and orange peels. The taste is very strong and a bit lemon-sour. Earthy/yeasty notes and a chemical flavour of alcohol and solvents. Broth and sweet exotic fruits; mostly oranges but also some apricots. The quite mild aftertaste got fruity flavours - mixed citric fruits, some spices, a quickly passing bitterness, rye bread and quite a lot of warming alcohol. Dough and lemons in the finish. The carbonation is strong; the sharp bubbles are very small. The liquid is a bit thick and sticky. If I didn't know what this was, I would have guessed "a Frensh bière de garde with some lemon peels". I found this one too heavy and... unfinished. Besides, where are the juniper berries? Bottle shared with Matt and Mike. Beer is light amber with a good head that falls back quickly leaving a little lacing on the glass. Carbonation is low. The aroma is slightly sweet, with some spice that comes up as the beer warms but not too much. It actually kind of smells like a barleywine. I like the aroma. Beer is sweet but not cloying, it is quite sweet though. Medium bodied and coating on the palate. For as high ABV as this beer is it hides it well. The finish is a little thin and moderately dry but overall its a decent beer. Not as herbal as some of the other Sahtis I've had. Pours a very cloudy apricot orange colour, with a really lovely fluffy head of fine and silky white foam. Lacing is good. Looks still and bulbous in my tulip glass, not very active, but not bad. In fact, it looks very thick. I have to say I heartily approve. Fair bit of honey, with a very fragrant, probably hoppy, but given the style possible not, character. Something rich and organic as well, not dissimilar to a Belgian yeast note. Almost a smoky character coming through as well. Lots of slightly unusual characters. Not as insanely bizarre as I'd expected from my first Sahti experience, but enough oddities in the aroma to keep me guessing. Taste is particularly odd. There's certainly more of the honey note, and the gin-like juniper note is present in a sharp pinpoint at the very back. Otherwise, the palate is full of bursting malt and light phenolic alcohol - to my mind, quite reminicent of a dry Belgian pale ale. There's just enough bitterness to tip it out of the true Belgian style profile, and the character of the bitterness is slightly different to hops, but it's very subtle. Some light citrus comes in late as well, like orange peel. Nice. Note a huge note from the rye, although there is a depth to the grain character. Mouthfeel is particularly smooth. All up, this is a very tasty brew, and a wonderful uniqueness. A very pleasant, refreshing and surprisingly drinkable brew. I particularly liked the thickness in the body, which just makes you have to appreciate all the different flavours as you chew your way through it. You know, I was expecting to say something akin to "not a beer for everyday", but I certainly could drink this everyday. It really is terribly pleasant, and not nearly as confronting as I'd been led to believe. Appearance: Opaque light orange brew. It has more head that I imagined this style of Beer should have. For some reason I had the preconception that Sahti was flatter than this. That's why we drink 'em! Smell: Pronounced honey aroma, not unsimilar to Polish meads like Jadwiga (spelling?). The honey seems to come from a very floral source. This isn't clover honey for sure. Taste: With a smell like that, you'd think this Beer would be cloying as hell. Not at all, at least not to the level I expected. The rye is what really comes on strong and gives flavors of baked goods. Especially when the flowery come play around your tongue, it's like a slice of some kind of east european dessert bread. For such a rich and complex brew, I was astonished by how well it drank. But what really floored us was the 11% ABV. Very interesting Beer from a brewery that seldom dissapoints. Poured a dirty brown/orange with a soap ring head and lots of floaties and yeasty sediment. The nose is very intense, very sweet and fruity with a big hit of alcohol. The flavor is very woody and earthy with mild fruit underpinnings. The finish is very sweet and has a big hit of alcohol and juniper in the finish as well, but without being bitter. The mouthfeel is thick and warm and very sticky leaving a long lingering feeling. Appearance: Pours out a lightly hazed, orange-amber body with a smallish, scant, white head. Smell: Expressly aromatic nose of fresh honeycomb, a heavy layer of herbs, young juniper seedlings, marzipan, spice, and even a few hints of alcohol. Taste: Altogether sugary sweet taste of honey candy leads the way, but this is followed by strong, sharp herbaceousness I'll attribute in part to the wormwood. It's odd, in the span of a couple months, I went from having zero beers with wormwood in it to four. For me at this point, it somewhat harkens back to the gentian-laden Weyerbacher Decadence. Juniper presents some woody and fruity hints. Touches of spicy rye. Lightly acidic. A few slim traces of almond syrup. Blips of peppery alcohol on the backend, though nothing to denote a beverage of 11%. Dry, long finish with none of the flavors wanting to retire quietly. Mouthfeel: Medium-bodied. Medium carbonation. Some stickiness to the mouthfeel. Drinkability: Interesting and arresting, particularly as it's not everyday one comes across a sahti, particularly one so boldly and uniquely envisioned as this one. That said, this isn't a brew I would reach for on a daily basis. Pours a hazy gold color with a slight head. Nice unique, earthy aroma with honey notes being the most prevalent. Slightly musty, but in a good way. Taste is also unique. Somewhat sweet with a medicinal finish. First time with a Sahti so descriptions are failing me... I like it though. Nice presence on the palate with an excellent drinkability at 11%. Appearance: Golden orange colored beer to the point that it turns brown in the widest part of the glass. An aggressive head forms as the beer shows its carbonated vigor. A seemingly bubbly head sticks around for a minute and then recedes without any lace. Smell: Awesome and powerful. Wow. How did they get this to smell like such a fresh collection of honey? Fresh honey, dense malt, herbal hops, and a tad bit of juniper in there too. Such an explosion of aromatics. Taste: A solid base of malts that includes rye, is evident in this beer. Caramel, darkened cereal grain, caramelized honey, clove, and other spices persist. Still, there is a hop presence that is earthy, along with some booze to finish it off. Mouthfeel: Creamy, boozy, smooth, but also very herbal and intriguing. It certainly has me engaged. Drinkability: This was a phenomenal experience. Certainly a winner here that deserves lots of contemplation. A complex brew that dignifies old world brewing, upcoming craft breweries, and the inventive attitude that brings us there. Pours a murky light copper in color. No head forms on the pour. Smell is light fruit, mostly lemon and some kiwi. Can't quite put my finger on the flavors. Never quite experienced the flavors that I'm getting in this beer. Decent carbonation and fairly smooth in the mouthfeel. You get a hint of the alcohol in the flavor. A little heat in the back of the throat. A new experience. Not something that I'll seek out, but quite the experience. This beer pours a cloudy amber-orange color. The head is two inches in height, and recedes slowly leaving nice lacing. The aroma is very herbal (juniper and lavender) with a solid mead-like character. It is a very strong aroma, and has nice complexity. The taste is a nice balance of sweet malt, herbs, honey, and a considerable alcohol presence. The mouthfeel is medium-full bodied with a velvety texture, and moderate carbonation. Overall, this is the first Sahti I've tasted, and I really like it. I would really like to see some American Craft Breweries tackling this rare style. Long neck 1 pt .9 oz. bottle with a green and yellow label that has a clear Nøgne Ø with a twig of juniper berries in front of it. Also on the front, there should put a white strip below the main label that contains some of the mandatory US information and the ingredients. To the right of the Ø is a nice and long paragraph that gives the history of the style and all the ingredients that went into this beer. If you keep on reading, you're going to find all of the mandatory US information, the ABV %, and a batch number and best before date in a white box. It would have been great if there was anything in the box! Thanks for missing my bottle Nøgne. Appearance: I wasn't sure of the proper glassware when I opened it, so I poured it into my Corsendonk Tulip for the hell of it. Be warned! My bottle was a gusher and your bottle could do the same exact thing. The first thing I noticed about the beer was all the particles floating around this beer. I didn't think that all of those were yeast particles. As for the color of the beer, it was a dark amber orange with a tiny streak of yellow at the bottom of the beer. The head of foam was as impressive as the color and the beer's murkyness. The head of foam was a little more than 1 inch in height and cloud white in color. It had great slow retention that left behind a milky white film and quite a few streaks of lace. A top notch appearance indeed. I can't wait to taste all of those particles that were floating around this beer. Smell: This was one truly unique aroma. I'm not sure what some of these aromas were because I've never smelled them before, so I'm going to give this my best shot. The aroma of this beer was hugely herbal. It was a wheat based herbal aroma that started off with malted wheat and a gentle touch of malted rye. After the aroma gets the grains out of the way, in comes the weird stuff. It was herbal with what smelled like chocolate, twigs, juniper berries, a whiff of sweet honey, a few flowers, and then it finishes up with a hint of wormwood. In other words, it was very unique and very good. There was no shortage of herbal scents in this beer. Taste: Now for the almighty taste! The taste was just as herbal as the aroma, but not quite in depth as the aroma. It started off with a subtle taste of malted wheat and malted rye. After all the grains have their turn, in comes all the herbal flavors. This part of the taste was herbal with a small variety of flowers, a gentle touch of honey, a few twigs, a hint a juniper berry, and a taste with what I believe was the taste of wormwood. Toward the back of the taste is where I picked a slight yeasty and hop bitterness to the taste. In the end, this beer had a very good well balanced herbal taste. Mouthfeel: For a staggering 11% ABV, I have to say that this was more of a medium bodied beer than a strong full bodied beer. I really couldn't feel all that much carbonation to the beer. Let's just say that it had enough carbonation to move this beer around. This beer had a mildly herbal aftertaste of wormwood, honey, flowers, juniper berries, and twigs. This herbal aftertaste will not stick around for very long. Drinkability: This was my first ever Sahti. I've wanted to try one, but couldn't ever find one until this day. It was a very unique beer that I would like to try again. If you ever want to try something for the old days and unique at the same time, then crack open your wallet and try this beer. Like most Nøgne beers, it will get pricey but you get what you pay for. Served at 55 in a tulip stem. The color is a thick and rusty. A murky brown, that surprisingly, is not at all see through. A somewhat warm and spicy scent, with a gentle pine and juniper presence, not overwhelming. Small head, you keep expecting to smell some hops here. A remarkably smooth pull from this glass for the strength hiding within. A very pleasant rich taste is not overdone at all with the earthy ingredients. The light honey sweetness is nice, and for the potency, is very well done. There is a fuminess of this that cut right to the brain, perhaps thats the wormwood... hmmm. It makes me wonder about setting one of these back to calm the alcohol in this. This is certainly a supper, but we probably saw that a mile away. While there isn't really anything that makes me want to drink this frequently, I am quite pleased to try such a unique brew, and to have a little taste of my Swedish heritage. Well done. Belmont Station sold me this a couple days ago; a 0.5l brown glass bottle, a joint venture between Norwegian 'Nøgne Ø' and Swedish 'Dugges'. Poured to a pint glass. "This is Sahti our way. 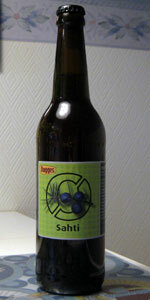 Sahti reinvented" - Nøgne Ø label. S: Ahhh, the closest thing I liken this to is 'Houblon Chouffe' - the perfect (in my nose) melding of grassy/piney hops and sweet/honeyed malt. 'Belgian IPA' aroma, and that is a very good thing. I suppose the unidentifiable parts to the aroma (and, later, the taste) are the wormwood, juniper and heather. Damn if they don't smell divine. T: Whew, huge flavor! An intense grass/honey herbalness married to just enough flowery/piney hops. Apple/pear, followed by a big grass-and-evergreen flavor. You may have read this mfar: what I got from the aroma fully translates to the taste: spiced wood, cut grass, fresh fruit. Yum. M: Somewhat heavy (thanks 11%! ), has a coating layer of both hops and wheat-y malt. Medium body, bordering on 'full'. Not quite 'syrupy', but getting close. D: Despite a lofty ABV, this has surprising drinkability. Falls right into my palate range for 'awesome': beautifully balanced, bright and clean, alcohol level hidden, and so on. If this is $9 then gladly will I pay it: delicious and crave-able. Thanks to Nøgne Ø/Dugges for helping to revive a nearly forgotten style...and thanks to Mom for her 100% Swedish ancestry, to which I'll give huge credence to for making this so damn likable. D. E. L. I. C. I. O. U. S.